I’m excited to share the title and front cover of my latest book project, a biography of baseball great Ken Boyer. 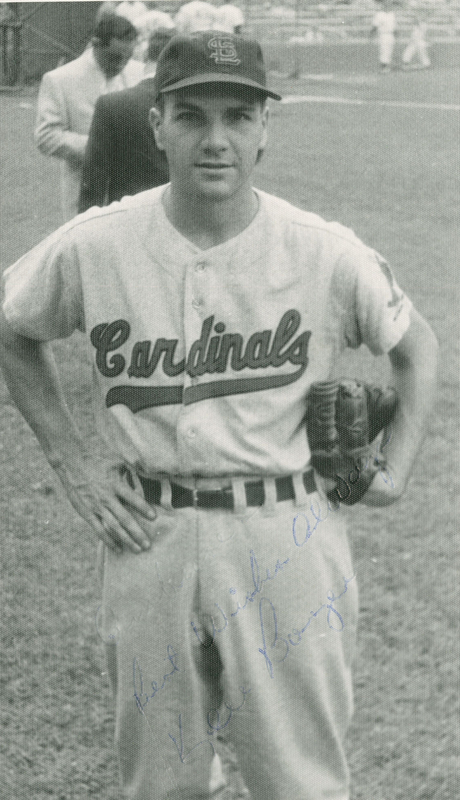 Ken Boyer: All-Star, MVP, Captain tells the story of Kenton Lloyd Boyer (1931-1982), who played major-league baseball for 15 seasons, most of them with the St. Louis Cardinals from 1955 to 1965. He spent his last four seasons with the New York Mets, the Chicago White Sox, and the Los Angeles Dodgers. He was a five-time Gold Glove Award winner for his exceptional defense at third base, an 11-time All-Star at the same position, and the recipient of the National League’s Most Valuable Player Award in 1964. The book also explores his personal life, his childhood in southwest Missouri, his minor-league career, and his coaching and managerial careers. 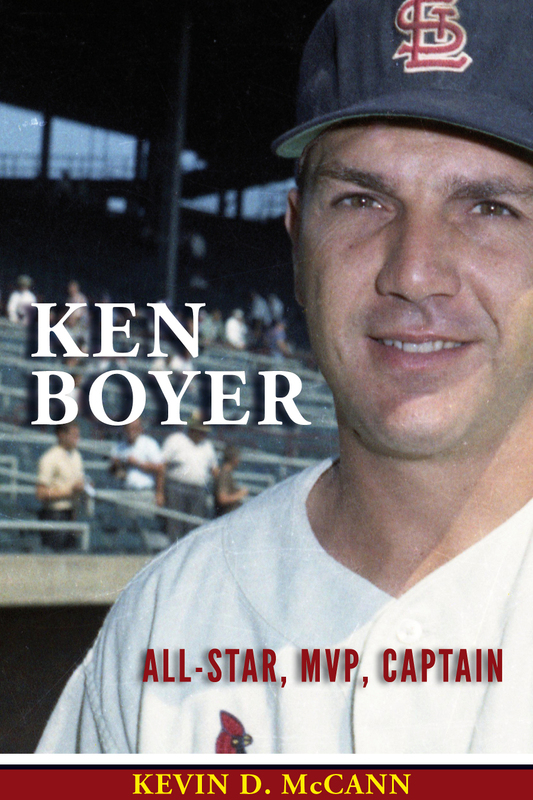 Ken Boyer: All-Star, MVP, Captain is tentatively scheduled for publication in August 2014, to coincide with the 50th anniversary of both the Cardinals’ 1964 World championship and Ken’s MVP season. To learn more about this project, please visit my book page, like my Ken Boyer page on Facebook, or follow it on Twitter. 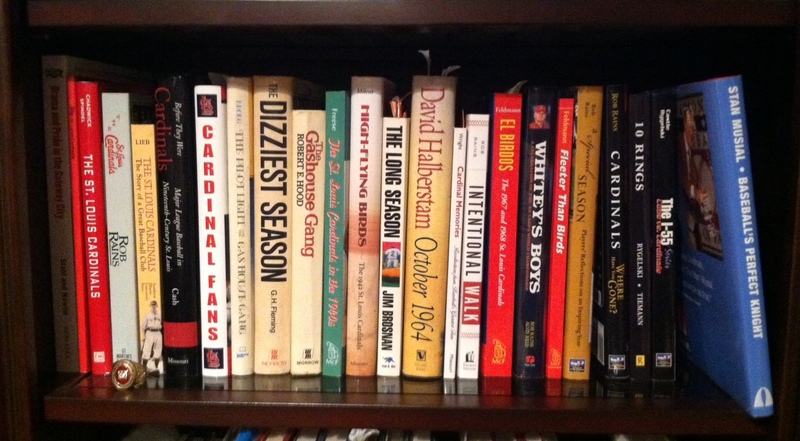 As baseball author and book reviewer Ron Kaplan notes on his blog, the 2013 World Series between the St. Louis Cardinals and the Boston Red Sox will spawn a slew of books about the winning team before the holidays. 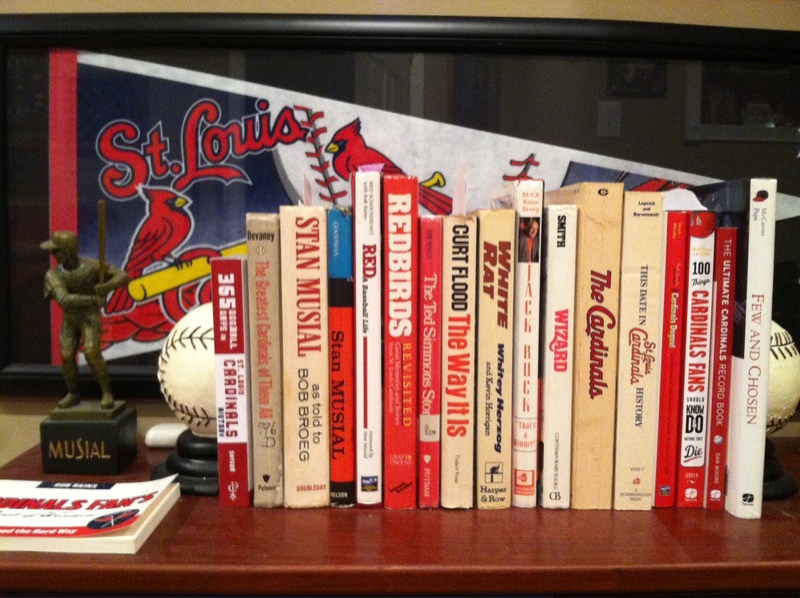 It’s interesting for me to see the collections of fellow book collectors/hoarders, and sometimes they share photos of them on their blogs or in Facebook groups such as Baseball Books. 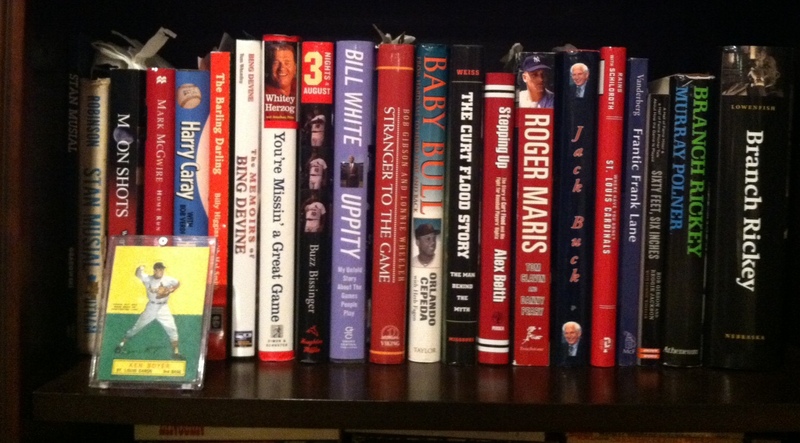 Ron, a devoted Yankees New York Mets fan,* shared his modest collection of Red Sox titles. * Big correction: Ron is a Mets fan, NOT a Yankees fan. Big difference! 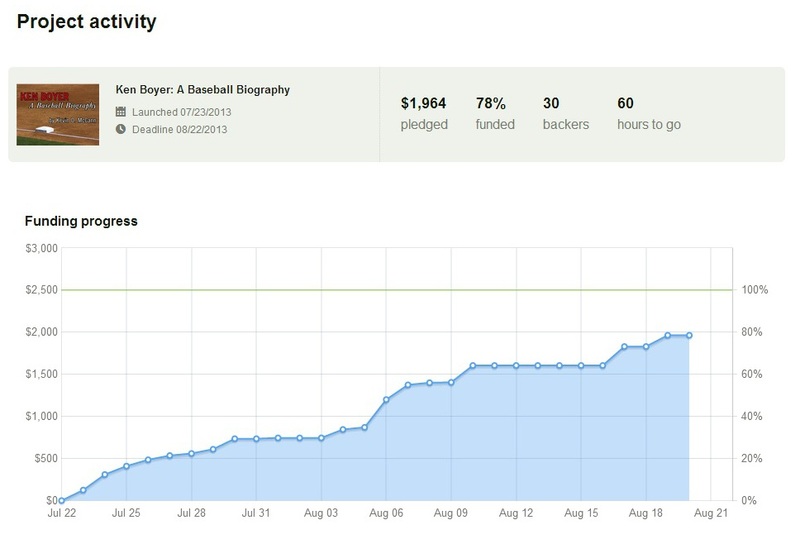 Thanks to 42 backers (actually 44 to account for two contributions sent by mail), the Kickstarter campaign for my Ken Boyer book was successfully funded at 9:48 PM CST last night! After the first effort in February and March fell very short of the $2,500 goal, I had my doubts whether this second try would succeed. But a friend thought that tax preparation time was a bad time to ask anyone for money–which in hindsight makes perfect sense!–so I regrouped and gave it another try in July and August. Thankfully, it was a success. I’m amazed at the outpouring of support for my project, especially in the last few days as the deadline to fund this Kickstarter effort drew closer. Honestly, there were moments when I doubted the mark would be reached in time. But every one of you came through to make this possible. And for that, I will be forever grateful to you. Longtime friends, Cardinals fans, and baseball fans in general really stepped up to the plate and showed their support for me personally or how much they wanted to make this book to be written and published. What has really struck me is the faith that Ken’s children and grandchildren have showed in my work through their pledges, emails, and Facebook messages. This is the most rewarding aspect for me–to have their approval for my project as it goes forward. Thank you to Christine Coleman, lead writer for Aaron Miles’ Fastball (a Cardinals blog), for emailing her fellow Cardinals bloggers about the project. It led to two posts at the Cards Conclave and Redbird Rants (courtesy of Daniel Solzman) in the days leading up to the Kickstarter deadline. Thank you to Wade Forrester of the Facebook group St. Louis Sports Talk and Facebook page On This Day in Cardinal Nation, for helping promote the Kickstarter effort on them. Thank you to Cardinals TV broadcaster Dan McLaughlin for retweeting Daniel’s tweet about the project. Thank you to Ken’s children Suzie, Danny, and Jane, and to his grandchildren Brook and Jake, for their pledges and support. 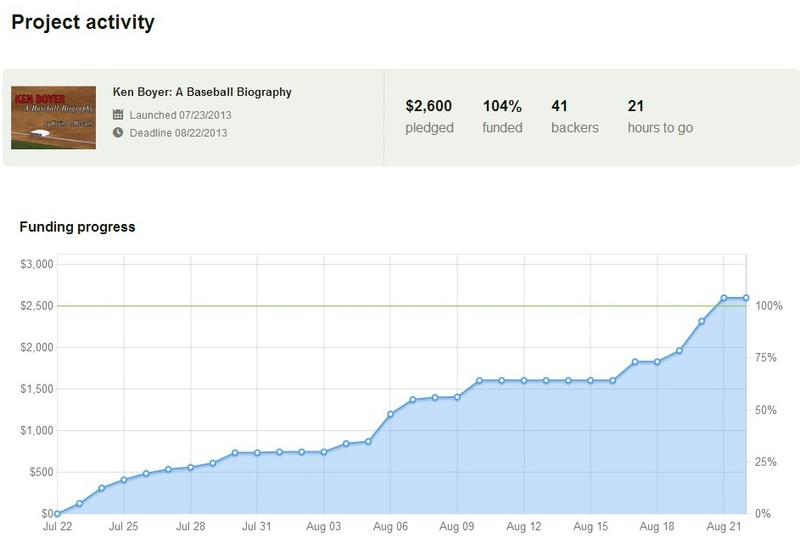 Thank you to all 44 backers who have placed their faith and trust in me to accomplish my goal of writing and publishing a book fitting of Ken Boyer’s legacy. I will do my best to make you all proud! Yesterday, pledges were added or increased to my Kickstarter effort for my Ken Boyer book to bring the total amount raised as of this morning to $1964. Anyone who knows about Ken Boyer and the St. Louis Cardinals realizes the significance of that number. It was in 1964 that the Cardinals made an August-September comeback to clinch the National League pennant on the last day of the season. It was also the year that Ken, the team captain, batted .295 with 24 homers and 119 RBIs and was named the N.L. Most Valuable Player. Whether it’s successful or not (though I hope it is! ), I’m very grateful and appreciative of the support shown through the pledges that have been made. It’s nice to know there are still fans of Ken who remember him and the personal qualities and talent he brought to the St. Louis Cardinals and–I’m finding out–to the other teams he played for and managed as well. If you would like to make a pledge, please visit the Kickstarter page and click “Make a Pledge” in the right-hand column. Thank you! On Saturday, I had the opportunity to interview former major-league pitcher Tommy John, who was Ken’s teammate with the Chicago White Sox in 1967 and ’68. The two became good friends and Ken would invite him to go quail hunting in the winter near his home in Hermann, Missouri. I’ve been working diligently on the manuscript this past week and have finished a first draft of the chapter(s) dealing with Ken’s minor-league seasons at Lebanon and Omaha, as well as what I know so far about his military service. This week, I will start working on his season with the Houston Buffaloes of the Double-A Texas League. It was his performance at Houston that convinced the Cardinals he could be their starting third baseman in 1955–and for years to come. UPDATE: While writing this post, a $75 pledge was made to bring the total to $2,039.14! Only $460.86 left to go in 59 hours. 2nd UPDATE: A $15 pledge has brought the total up to $2,054.14! Only $445.86 left in 58 hours. With a few starts, stops, and restarts in between, I’ve been working on my book project about St. Louis Cardinals third baseman Ken Boyer for the past two years. Now I want to complete my research and start working exclusively on the manuscript in order to have it ready for a 2014 publication date. Please take a moment to learn more about the project and look over the rewards I’m offering. As of today, $745.14 has been pledged with 20 days to go. The goal is $2,500, and it’s an all-or-nothing proposition: if I don’t meet the minimum amount, my project receives none of it. Christine Coleman at Aaron Miles’ Fastball (a great Cardinals blog) invited me to write a guest post to explain the project and the Kickstarter campaign. I hope my fellow St. Louis Cardinals will support this effort. Pledges will go toward research and travel expenses, including a trip to St. Louis this summer to do work at the public library and the Mercantile Library, as well as interview Kathleen Boyer (Ken’s wife) and family members and teammates. To follow my progress, please “like” my Ken Boyer Facebook page and follow my new tweets!